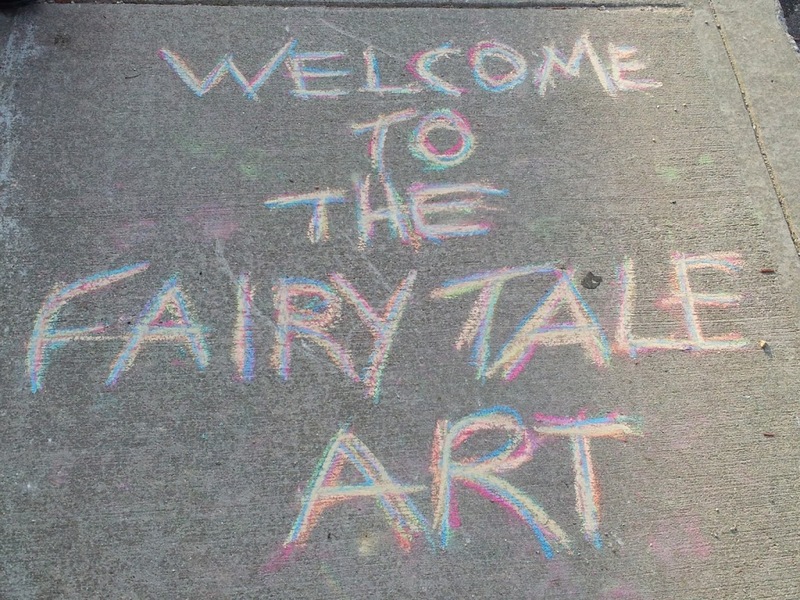 What do kids know and understand of fairy tales? How do they interpret them? I, as a storyteller, was wondering and used sidewalk chalk as a way to begin exploration of the questions. 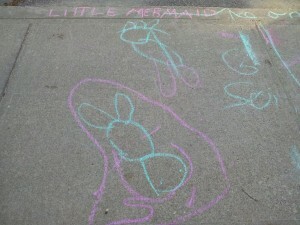 I work in an after school program and thought the kids would enjoy a spring afternoon with sidewalk chalk. I began by reminding them of our visit to a local art gallery. I pointed out how each piece of art had its own space and people walked by admiring them. 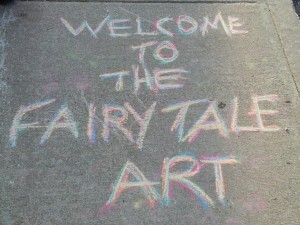 I proposed we make a fairy tale art gallery on the front sidewalk for the parents to look at when they came for pick up. Sidewalks are broken by distinct cracks, this sure makes building a student art gallery easy! 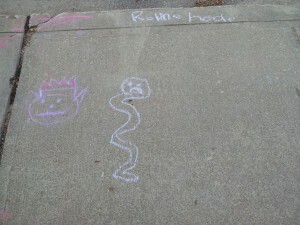 Each of the kids was assigned a segment of our walkway. 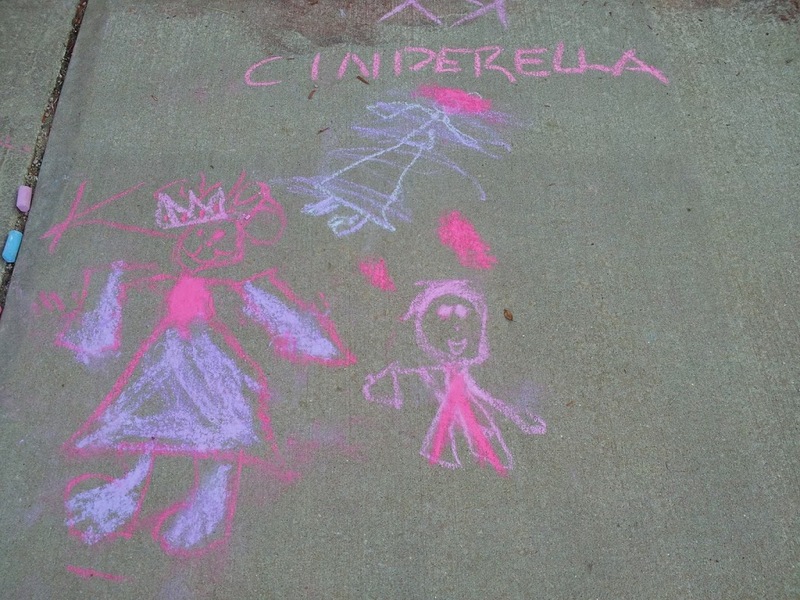 I said our art show subject was fairy tales they could draw a picture from any fairy tale they wanted, I then gave the example Cinderella or The Little Mermaid. Right from the example we have Cinderella in her beautiful gown and wearing the crown. Two of three step sisters are present but not as glamorous at all. The third step sister fell off the curb, I was told this! ( I titled the art for them so we could read it) At 7 years old this young lady was focused on interpreting the happily ever after part of the story. 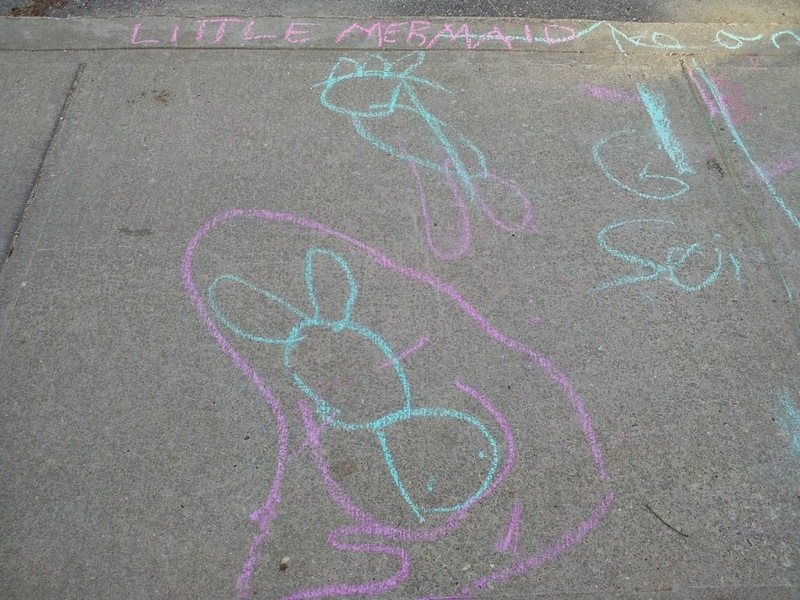 This little lady, just 6 years old depicted the Little Mermaid, again straight from my examples. She had many questions as to the requirements of the art before beginning to draw. I told them this was to be their art, anything they wanted to show from the story, no rules except stay in their square and physically on the sidewalk. The Little Mermaid is swimming into the cave in her picture. She chose to show a part that scares her, we talked about this and what made it scary, it was not knowing the outcome. I love this one, it has a special meaning. This young lady was 8 years old. She chose the 3 Little Pigs to draw. In this scene they are dancing, the wolf is gone. 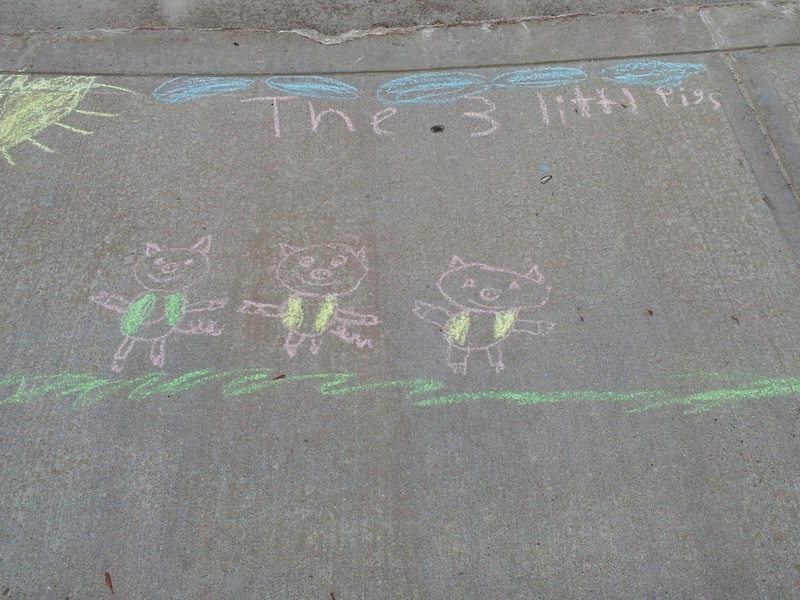 I asked why she liked this story and was told, “because the third pig is smart, he built a brick house”. I know this represents safety to this little girl – all the buildings in this housing project where they live are BRICK! 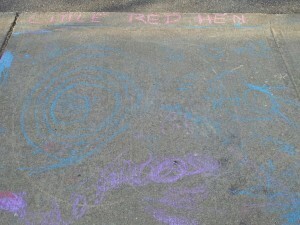 A 6 year old boy drew this rendition of the Little Red Hen. He is a very physical boy, in constant motion as he drew. The blue spirals were her fields and the pink is Mrs. Hen herself. He commented he wasn’t good at chickens – he didn’t know any! This tied in nicely with all the garden work we have been doing. This artist was 8 years old and chose Robin Hood to depict. I did not go into the difference between fairly tale, folk tale and legend, I wanted them to have a totally positive experience and for me to leave it as much to their interpretation as possible. 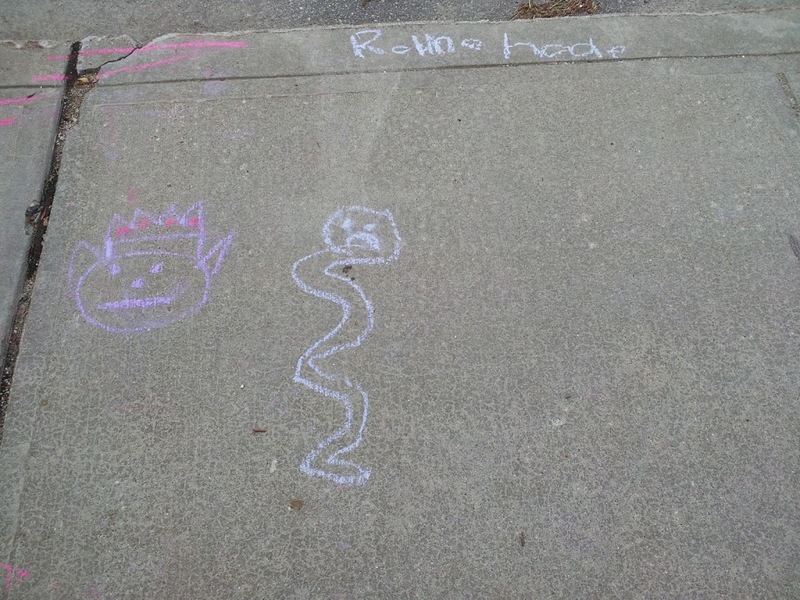 Robin is drawn with a crown, I’m not sure that he would like to be part of the royal family but I believe her interpretation was of power and good. I am most interested in her using the form of a snake as the image for the “bad guy”. The evil serpent certainly has a frown, Robin isn’t happy he is fighting for his money I was informed. This student is 9 years old. I thought it very interesting that she did not pick a particular story but singled out the common character from many stories. In her words “they all have a mean guy”. This was also her writing, it’s boldness certainly showing some of the strength of the character. 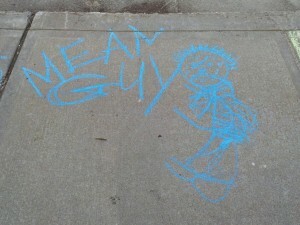 She laughed and commented he wouldn’t be a mean guy when it rained. What power it is to show what is scary and know it would be gone the next morning! This use of fairy tales was a fun project the children enjoyed and were proud of. They were very excited to show family members at pick up time. There was much more excitement over this art, than art on paper, I believe because it was so public a space. This few minutes of sidewalk time was a window into their world. Fairy Tales have a place in children’s learning to give voice and interpretation of feelings that are complex. They have the power to give hope and wipe out evil with a single rain storm! This day at our after school was a happily ever afternoon!